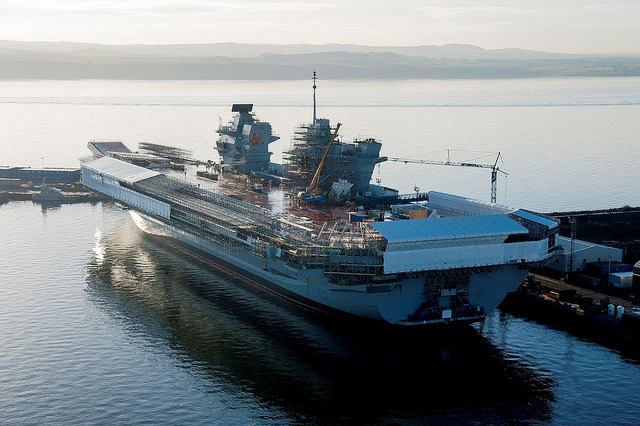 As I write this the first 500 tonnes of dieso fuel has just finished being embarked onto HMS Queen Elizabeth the first of two giant aircraft carriers being assembled and commissioned at Rosyth by the Aircraft Carrier Alliance (ACA) for the Royal Navy. This is part of the preparations being made for starting to run the ship’s diesel generators which will then allow the 11,000V High Voltage system to be energised by the ship’s equipment and the low voltage supplies to be derived from the HV. For the first time the ship will be live without being reliant on a shore electrical supply. Starting the diesel engines is scheduled to occur in May and the ACA are working hard to achieve that date. Once the diesels are running it will be possible to start to commission the power and propulsion systems through the propulsion converters and eventually leading to turning the shafts. A temporary HV cable is being installed across the flight deck to a load bank ashore so that the generators can be load tested up to full power, and with a total of 110MW of power generation capability aboard, including the gas turbines, there is a lot of energy to be absorbed, either through the shafts and the brake propeller blades or through the load bank or a combination of the two. The sixth drop of software for the Integrated Platform Management System (IPMS) has passed its factory acceptance testing at L3’s test facility in Bristol and is now available to be installed on the ship’s hardware. This will provide the commissioning engineers working on the platform systems with functionality which will allow them to progress in setting the ship’s systems to work. The network of fibre optics that make up the ships Integrated Network Environment which provide the backbone on which the IPMS and the various Command and Control systems run is making good progress in being installed and progressively set to work. Both the Ship Control Centre and the Operations Room now have live computer screens displaying real data. The second ship HMS Prince of Wales is also making good progress in the build dock at Rosyth. 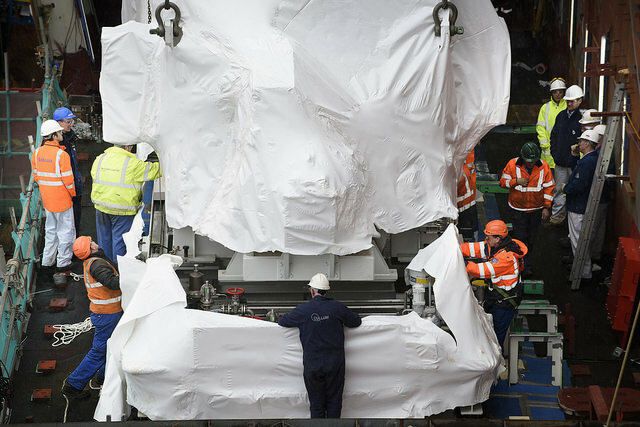 The first of the two Rolls Royce MT30 Gas Turbines have been installed onto the sponson on the starboard side, and the enclosing sponson structural blocks have been installed around it. The remaining starboard side sponson blocks are in the process of being installed, while on the port side the first part of the catwalk has been installed. Already the full 70m width of the flight deck is visible. It is less than a year since we floated HMS Queen Elizabeth out of the dock, yet looking from the project office at the head of the dock we can already see a second aircraft carrier taking shape. Away from Rosyth Lower Block 04 of Prince of Wales, which completes the aft part of the hull is progressing at the Govan shipyard and will be transported to Rosyth later this year. The capacity of the Queen Elizabeth Class integrated communications system has been successfully demonstrated in a large scale trial at the Royal Navy Training School HMS Collingwood on the South coast. This three day trial involved 70 serving Royal Navy personnel operating 120 Tactical Voice Terminals linked through a fibre optic network in the same way as they will be on the ship, and tested the system well beyond its designed capacity. More than 20,000 operator actions were made over the course of the three days, proving that the system can run 600 active phones while still supporting 1,100 concurrent group and open line users. In February 17(Reserve) Squadron became the first UK squadron operating the F35B Lightning 2 jet aircraft when they started operational testing with the first of the UK’s aircraft at Edwards Airforce base in the USA. 17 Squadron was formed in 1915 and to mark the 100th anniversary of the squadron a fly past with the F35B has taken place in front of the Chief of the Airstaff. This squadron manned by RAF and Royal Navy flight crew and engineers are now operating and maintaining the aircraft completely separately from their US colleagues which is an important step towards the first flying trials with HMS Queen Elizabeth off the east coast of the USA in 2018. At the aircraft carrier’s home port at Portsmouth Naval Base, preparations are being made for HMS Queen Elizabeth to arrive having completed initial sea trials in late 2016 or early 2017. These preparations include everything from civil engineering work to prepare the jetties and provide for a High Voltage shore supply to arranging for the office accommodation and car parking that will be required for the ship’s crew and contractors needed to operate and support the aircraft carrier in service. Once again, I cannot but marvel at the management skills and abilities in administration to Engineer the building, out-fitting and all aspects of development of these vast vessels: so…swords (or ships) to plowshares (or private sailings). Clearly all aspects of the project are possible with our existing facilities and abilities: so why in heavens name (and indeed that of any new Government) can we not now build commercial vessels of this stature. Answers, please David, ASAP. And hopefully before the growth in the cruise market (presently 15% pa and even including grumpy old Engineers like me) once again is met from foreign yards. If I recall, the cost of these vessels is £1.5 billion. Heavens, we could get 20 of them (all revenue earners) for the price of a small war, the same number (revenue earners) for the price of the HS2 railway and another 20 covers (cf Chernobyl) to satisfy the doom and gloom merchants worried about nuclear fall-out from the new and projected nuclear power stations. Did I miss something? Although impressive, the project is hardly unqualified success. The cost has doubled since it was first announced and the ships are not even commissioned yet. 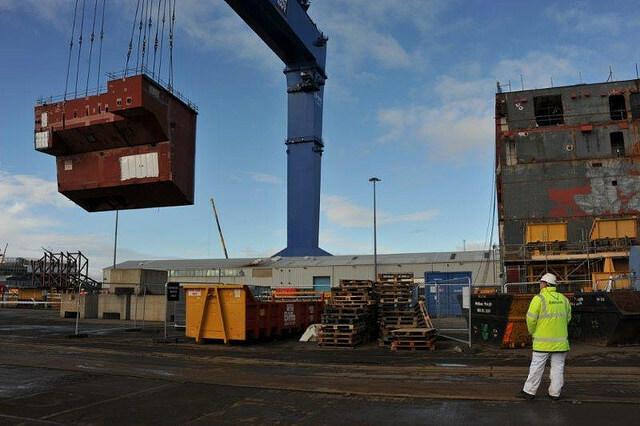 Because of the scale of the project we’ve had to have blocks built in various yards across the country which would be completely unworkable for any serious commercial shipbuilding project. The UK’s limited shipbuilding facilities are at least 30 years out of date. This, combined with our lack of skills means that UK shipbuilding is only going to continue it’s decline. Shipbuilding should always be treated by this country as a strategic industry, not just for warship building but for commercial ships as well. We need at least a minimum and expandable capacity to build all types of ship. Likewise we need a minimum and expandable Merchant Navy and likewise Royal Navy to protect them. Our long term health and wealth has for centuries relied on world trade. The world is a volatile place. The people we trade with and the ships that transport that trade can and do change. We need to retain a strategic minimal and expandable capacity in all these things. If we make that capacity as efficient as possible then we can make real (export) money out of it as well. For an developed, trading, island nation to do otherwise is madness. The Japanese have recognised this and have taken steps to ensure the robustness of their ship building industries. This is a matter of national resolve, which we know when we decide to do something we can. As I believe fellow bloggers will know, this is an industry about which I know “0”! [I was born in Portsmouth in 1940 -father was an Engineer ‘attached’ to the Royal Navy-albeit a civilian: and in a former post -he had, working for Weygood Otis (lifts), been part of the team which had designed/ installed the elevating acilities in RMS Queen Mary. [High on the list of unlikely excuses to my mother when they were ‘courting’ for not taking her out would have been: “sorry, I have to go to Glasgow to put the lifts in the QM” -even if it was true!] So I claim a slight link to the sea! I did as a student visit Denny’s of Dunbarton (close to the John Brown yard?) and recall a foreman (complete with bowler hat) telling us that ships were all about ‘building boxes’. Perhaps now that the boxes are bigger and bigger…we have to build them all over the place and then warehouse them all together. I wonder how long it would take Parliament/’them’ to vote the money to build the finest shipbuilding facilities on earth if they were convinced that such was a direct counter to a threat to our defence? Tax or borrow? Who cares as long as ‘they’ survive? If it is accepted that all threats to the State in the end have a strong economic bias: [I still smile at one blogger’s ‘we will be the best defended bankrupts in the world’] one can surely apply that argument to all elements of manufacture: why are we not doing so? Because far too many of our erstwhile leaders and betters are part of groups who have actually insulated themselves completely from the results of their actions, from capitalism, from market forces, even from Democracy! But I am far to old to care or do anything about it! Am I? Like h**l I am! PS father had expected to be one of the commissioning Engineers on the maiden voyage of the Queen Mary: he had ever bought a dinner suit as it was a big social occasion. A few days before he was called into the MD’s office and told that ‘as he didn’t speak very well, they were going to send one of the ‘front-office’ engineers instead. Father immediately resigned: telling the firm that when they wanted him back, which they would, they must send a Rolls Royce to collect him. They did! How will the UK’s planned new big deck aircraft carriers deal with the unexpected, but significant, problems that US Navy carriers are having in accommodating and deploying the undergoing-development F-35B fixed-wing fighter? What is the UK MoD doing to deal with the F-35B heat, noise and extreme jet blast issues?? “The (US Navy) ship’s going through hull, mechanical and electrical mods for the F-35, including environmental mods. Some of it is deck related and some of it is lighting related. It lands on the deck differently than the Harrier,” Walsh said. “The (54,000 tonne) USS America will undergo a series of intense modifications to ensure the flight deck can withstand the heat of the F-35B vertical take-offs-and-landings. “Navy engineers are installing a new heat-resistant material designed to prevent heat from the aircraft’s engines from burning a hole in the flight deck, Navy officials said. “The flight deck modifications entail adding intercostal structural members underneath flight deck landing spots numbers seven and nine, a Navy official said. F-35B fighter Heat, Noise- Issues For UK Carriers?? F-35B fighter: Heat, Noise- issues for UK Carriers?? Hi david, I have a question that I would love for you to answer…from my understanding there is capacity to hold 8,600 tons of fuel to support vessel and aircraft. You mention 500tons of dieso fuel being loaded, what’s the capacity of dieso fuel the vessel can store? It’s great to see the UK with something the world will envy. Expensive? Yes… and I suspect, like what was done for defense back in the 1930s, it’ll be worth every penny when we really need it and we’ll be so glad someone was smart enough to see the need for, and build us, two of them.